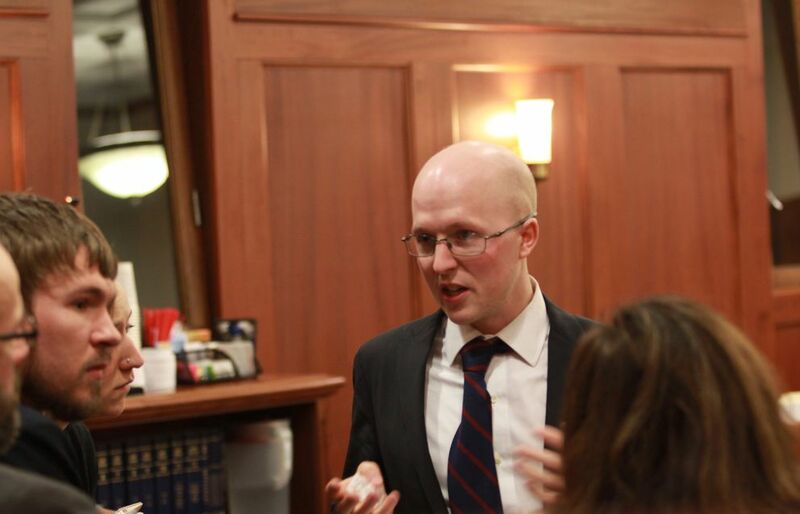 JUNEAU — The Alaska Legislature is on pace to pass fewer bills in this two-year session than in any other since the early 1990s — one measure of the paralysis inflicted by polarization and the state's deficit crisis. Lawmakers passed 37 bills between the start of their two-year session — in January 2017 — and Monday, according to an analysis by the Alaska legislative library. That's the fewest at that point in any two-year session since the start of the library's records, in 1994. The current Legislature passed last year's annual state operating and capital budgets, but only after months-long delays. It's passed contentious bills to open Alaska to ride-hailing services like Uber, and to comply with federal requirements under the REAL ID Act — as well as symbolic measures like one to commemorate black soldiers who helped build the Alaska Highway. But dozens of other bills have languished — passing the Republican-controlled Senate only to stall or die in the hands of the mostly-Democratic House majority. Or vice versa. The Legislature's slow pace of passing bills has thwarted lawmakers' own priorities and pet projects, as well as a major crime-fighting initiative pushed by Gov. Bill Walker. And it's frustrated individual Alaskans — some of whom have seen their favored legislation blocked in committees. The Legislative library's analysis is just one data point, and it's likely lawmakers will pass a barrage of bills as they approach next week's initial, 90-day deadline to finish the session. But legislators and political observers also acknowledged that both the budget crisis and the partisan divide between the House and Senate have made it tougher for the two chambers to advance their respective ideas. "Democrats and Republicans are looking at each other like they're enemies," said Ashley Reed, a longtime Juneau lobbyist. 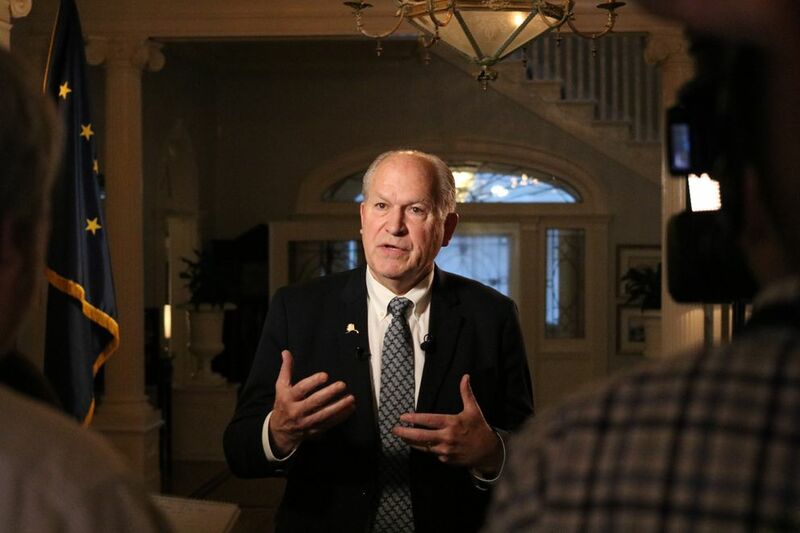 "They're not enemies — they should be Alaskans. But politics is really becoming part of it." The most compelling evidence of partisanship also comes from the data. Just three dozen bills have cleared both the House and Senate in the current two-year session. But as of Monday, there were 107 bills that had passed either the House or Senate alone, but not the other chamber — more than at the same point in any other session dating back to the early 1990s. There were 76 House bills stuck in the Senate and 31 Senate bills stuck in the House, according to the Legislative library's analysis. Part of that dynamic stems from logistics. Even in previous years, when both the House and Senate were controlled by Republican majorities, leaders in each chamber would hold legislation from the other as leverage. The gridlock would break late in the session, once the two chambers' leaders had time to strike deals allowing allowing batches of bills to move forward. "Both sides have to play fair. 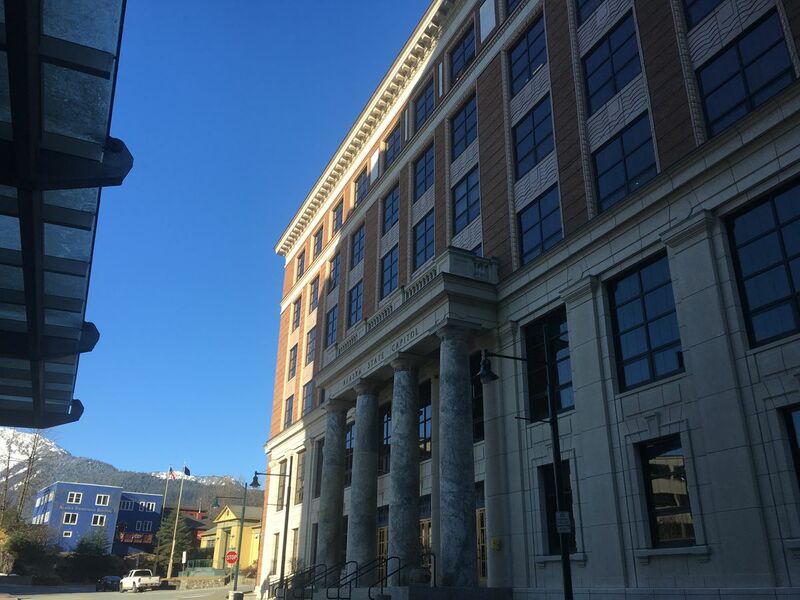 We're not going to do a whole bunch of House bills if a whole bunch of our bills are going to die over on their side," said Anchorage Republican Sen. Kevin Meyer. He chairs the Senate Rules Committee — the last stop for every bill in his chamber before it's scheduled for a final vote on the floor. But Meyer also agreed that legislation is moving more slowly because of the partisan division between the House and Senate. After the 2016 election, control of the House flipped into the hands of the mostly-Democratic majority coalition. Before that, both chambers were controlled by Republicans, who also had two years — 2013 and 2014 — to work with a Republican governor, Sean Parnell. 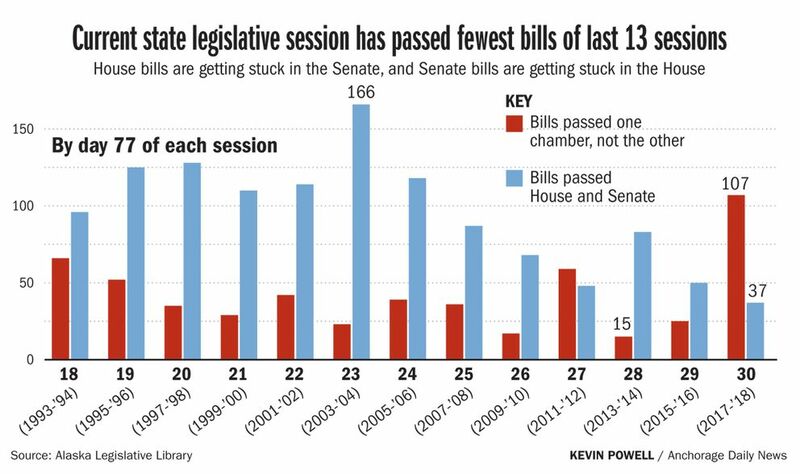 By this point in that two-year session, the Legislature had passed 83 bills, compared to 37 now. "When you have two Republican majorities and a Republican governor, we even got done in 90 days," Meyer said. Legislation, he added, "moves slower when you have a divided house." In the past two years, there have been a few high-profile cases of individual lawmakers in one chamber holding up broadly-supported bills from the other. But the broader slowdown may stem less from intentional vendettas, according to legislators, and more from the fact that lawmakers in different parties simply lack the friendly relationships that can lubricate work between members of the same party. If a Democratic House member, for example, has 10 bills waiting in the committee he or she chairs, they're likely to hold a hearing on one sponsored by a fellow House Democrat before one that's sponsored by a Senate Republican. "I haven't seen any signs of bad faith. On the other hand, the numbers do seem daunting," said Sitka Democratic Rep. Jonathan Kreiss-Tomkins, who has five bills stuck in the Senate. "And there is a sense of gridlock." Lawmakers said the state's deficit crisis has also consumed their focus for the past two years. The House was weeks late passing its spending plan this year, and debate over the measure dragged on for days, forcing the chamber to postpone committee hearings. 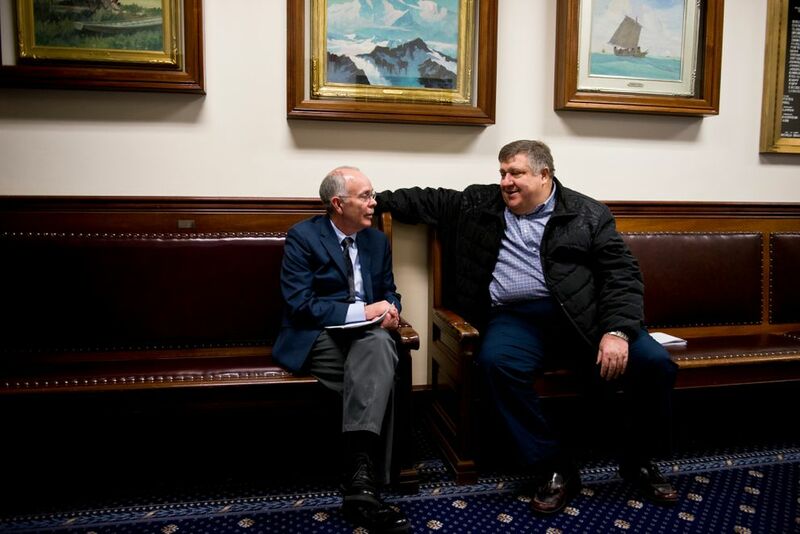 Kreiss-Tomkins said his own interest in the Alaska Permanent Fund's role in fixing the crisis has used up time in the House State Affairs Committee he chairs. That's pulled the committee's focus from other important issues, like the security of the state election system, he added. "There's a more concerted effort on the budget and time spent on the fiscal future of the state that takes away from working on members' legislation," said House Speaker Bryce Edgmon, D-Dillingham. Edgmon argued that the Legislature's focus on the budget has not distracted from its work on other big problems facing the state. But Walker, the governor, said this week that he feels differently. Early in this year's 90-day session, Walker introduced a package of eight bills in both the House and Senate to address rising crime in the state. None have passed both chambers. Through Friday, the Senate had approved just one: a bill to make it easier to run background checks on people who want to become police officers. The House hadn't passed any. Walker, in a briefing with reporters Tuesday, said it's too soon to call his bills stuck. "They haven't moved as quickly as we'd like, of course. But as long as they move between now and the end of the session, that's what we care about," he said. The budget, he said, "is a big issue," noting that the spending plan finally advanced from the House this week. "With that out of the House, I think we're going to see some more movement of some other bills," he said.